What are the symptoms of the stomach flu? How is the stomach flu diagnosed? When is stomach flu season? How long will the stomach flu last (norovirus and others)? How is the stomach flu transmitted (norovirus and others)? Is norovirus present in saliva? What is the incubation period of the stomach flu (norovirus and others)? How soon can I go to work after having the stomach flu? Can a person have a relapse of the stomach flu? Or catch norovirus again? What is the treatment for the stomach flu and what should I eat? If you just vomit one time, could it still be a virus? Will I be immune to the stomach flu (norovirus) in the future? Does the flu shot protect me from the stomach flu (norovirus)? Is there a vaccine for the stomach flu? Are some people more susceptible to the stomach flu (norovirus) than others? How long can stomach flu viruses live in my house (norovirus and others)? How can I avoid catching stomach bugs (stomach flu, stomach virus, norovirus)? Which hand sanitizers kill stomach flu viruses (especially norovirus) and C.diff spores? Which cleaning products kill stomach flu viruses (norovirus and Ebola)? How do you clean vomit and diarrhea out of the carpet and kill norovirus? What should be in my stomach flu survival kit? Do Benzalkonium Chloride and Benzethonium Chloride kill norovirus? Does cranberry juice, grape juice, black raspberry juice, pomegranate juice, red wine, apple cider vinegar, garlic, or grape seed extract, activated charcoal, or grapefruit seed extract prevent the stomach flu (norovirus)? Will taking probiotics help prevent me from getting the stomach flu (norovirus and others)? How can I get over my fear of vomiting and the stomach flu? What are bacterial and parasitic gastroenteritis? How do I report a sick restaurant or food service worker? How long does it take to get sick from food poisoning after eating? How do I report food poisoning? How can I avoid getting food poisoning? How long can food be stored in the fridge? How long is food good in the fridge during a power outage? Will I get sick from eating moldy food (bread or cereal)? Will my baby/toddler get sick from drinking an old cup of spoiled milk? The holiday season is also the peak of influenza and stomach bug season. Illness ruins many family vacations and Christmas mornings. 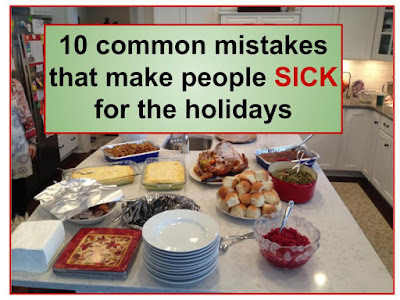 These 10 common mistakes (which most people make) significantly contribute to the rise in illness over the holidays. 1. Preparing food for others when you are sick. If you or a family member have been suffering with a vomiting or diarrhea illness within the past week, you should not make food for other people. People with stomach bugs are contagious for at least 3 days after symptoms have stopped. You can easily contaminate the food you are making with your germs, and then anyone who eats your food can get sick. Most people still make the food they promised to make even if they are sick because they don't want to disappoint anyone. Most people feel PROUD that they mustered up the strength to make that casserole for the party in between vomiting episodes. Most people are IMPRESSED with their own multitasking skills when they manage to change their toddler's diarrhea-filled diapers and finish icing the cookies for the school party. It is unlikely that they washed their hands good enough to make that okay. Trust me, people would be MUCH happier if you just didn't bring the food item that you promised to bring. If you work in food service, please don't got to work if you have vomiting or diarrhea! 2. Going to the party even if you or your child is sick. If you or your child was throwing up or having diarrhea last night, don't go to the party today! Yes, everyone will miss you, and you hardly ever get to see Grandma. Yes, it is a once a year event, and you hate to miss it. However, people with a stomach virus, like norovirus, are contagious for at least 3 days after symptoms stop, so you could very easily give your illness to others. Your cousin's kids could catch it, and it would ruin their Disney World trip next week. Grandma would likely catch it, and since she is in frail health, she might die. You could also start an outbreak in her nursing home. If you are sick and work in food service, please don't go to work. It is a gift that keeps on giving. 3. Cross-contaminating. Cross-contaminating is a great way to ensure that salmonella or E.coli ends up on someone's plate. Cross-contaminating means that you are transferring germs from a raw food such as the turkey or raw meat to food that won't be cooked such as fresh fruit and veggies. Don't use the same knife or cutting board to cut the raw meat and then the vegetables for the salad. Don't rinse the raw turkey in the kitchen sink and then wash lettuce in that sink. Don't handle the raw turkey and then touch the bread or silverware without thoroughly washing your hands. Don't wipe contaminated hands and surfaces with the hand towel and then keep using it for clean hands. Use a good disinfectant like Clorox Hydrogen Peroxide Wipes to clean food preparation surfaces, and wash your hands after touching raw meat every time. 4. Not using a meat thermometer. The pilgrims didn't have meat thermometers, and they were fine, right? Well, not for certain. They did had shorter life expectancies than we have today. Use a meat thermometer and cook your turkey until the center is at least 165°F (74°C), according to the USDA. That will dramatically reduce the likelihood that you and your guests will catch salmonella or campylobacter from the turkey. I cook mine to at least 170°F (77°C). Costco cooks their chickens to 183°F (83.9°C), and they are still incredibly juicy and delicious! 5. Leaving left-overs sitting out for several hours. I know, you are too full to get off the couch and put the food away. You are hoping that if you burp a few times, you might have room for another helping of stuffing, so you just leave it out. If you refrigerate leftovers within 1-2 hours, the food will most likely be fine. However, if you keep perishable food in the temperature danger zone (between 40°F and 140°F or between 4.4°C and 65°C) for several hours, bacteria can grow on it and produce toxins. Reheating the food will kill the bacteria, but the toxins will still be there to make people sick. So, leaving the food out for hours will make it much more likely that someone eating the leftovers the next day will get sick. This type of food poisoning is not contagious, but it will surely ruin the day for anyone who eats those leftovers. Even if you have left food out too long in the past and escaped unharmed, don't take the chance. 2 hours is the safe limit to keep perishable food in the temperature danger zone (between 40°F and 140°F or between 4.4°C and 65°C). 6. Putting left-overs away in containers that have too much in them. When you do get out of that recliner to put the food away, make sure to put it away in multiple small containers instead of all in one big container. If you put a whole turkey, a big pot of chili, or a big lasagna in the fridge, they will take too long to cool. The food will be in the temperature danger zone too long, and bacteria can grow. Divide the food up into small containers so it cools faster. Cut the meat off the turkey. Cut up that lasagna. Putting the chili in small bowls will make it easy to microwave for lunch the next day. Try to put the food away within an hour of eating and divide it into small containers so you don't waste any of that glorious food that you spent all day making. Makes sure your fridge is set between 35-39°F (1.6-3.8°C), too. 7. Inviting guests to your house when family members are sick. If anyone who lives in your house has or recently had a stomach virus, you should not have guests to your house. Stomach viruses like norovirus are very hardy and can live for weeks on household surfaces. They are also resistant to many common disinfectants. Cleaning with a solution of 10% chlorine bleach in water, Clorox® Hydrogen Peroxide Spray , or Clorox Hydrogen Peroxide Wipes can kill the viruses. It is hard to kill them all, though, so the best cleaning product is time. Try not to have company to your house until all have been well for at least a week. If you have guests before that, warn them of the potential risk so they can make their own decision about coming. Yes, people will be disappointed if you cancel your party but not as disappointed as they will be if they all come down with your stomach bug 24-48 hours after your party. 8. Sending your sick children to school. We all understand that kids are going to have to come to school with a runny nose and a little cough because those illnesses drag on for weeks. However, most people send their child back to school too soon after a stomach bug. If the child hasn't vomited for few hours, they send them to school. Unfortunately, many children will have a relapse and vomit again at school later that day, or they can start having diarrhea at school which can be humiliating for them. Since each microscopic spec of vomit or diarrhea contains millions of germs, the sick child can easily infect others in the class. They can get the little boy who sits next to them sick, and he can give it to his newborn baby brother. They can get that little girl across the table sick, and she can give it to her mother who is going through chemotherapy. Think of all the joy you would be spreading because you "couldn't miss work". It is very common for children to seem fine for 24 hours between vomiting or diarrhea episodes. Don't send them to school during that time. If you keep your child home for a day or two after symptoms have completely stopped to fully recover, they are less likely to give the illness to their classmates. 9. Not cleaning the bathroom. Most people's toilets are covered in germs. I swabbed some toilets and rubbed the swabs onto agar plates. You can see the bacteria growing on my toilet compared to a normal person's toilet. Since almost all contagious illnesses are spread through poop, keeping your toilet clean will reduce the spread of illness. Clorox® Hydrogen Peroxide Spray is a good choice for cleaning toilets. 10. Not washing hands enough. Wash your hands when you get home from any public place like school or work. Wash your hands before preparing food and after handling raw meat. Wash your hands after using the bathroom or changing diapers. Almost every contagious illness is spread through poop so keep those hands clean. I have WATCHED a friend make ground beef patties and then handle the buns BEFORE washing her hands. That is when I pretend that I'm not hungry and don't eat. If you are in a situation where you can't wash hands, use a strong hand sanitizer like Zylast Antiseptic or Clorox Hand Sanitizer . And be sure to wipe off your phone while you are at it. As a biochemist and mother of 3 young children, I've dedicated my life to educating people about these completely unnecessary and largely avoidable stomach bugs. If you would like more information, I have many more pages on this website about these issues that you are welcome to read. You can also email me or contact me on my facebook page. If you would like to know more about me, please read my About the Scientist page. I hope you and your family have a happy and healthy holiday season! If you have a question, comment, or personal story to share, email me (phd.annie@gmail.com). Learn more about me here. If you are interested in my experiments, please check out my Dr. Annie's Experiments website. You can join me on Facebook or sign up for my email list. Don't forget to subscribe to my YouTube Channel. I also have a secret facebook group for people who are terrified of stomach viruses, so e-mail me if you want to join the secret group.